Économique ET Animaux acceptés! Cette unité de 3 chambres, 1 salle de bain inférieure est dans un emplacement idéal juste en face du restaurant Oceanic, Crystal Pier, et l'accès à la plage Parfait pour une personne ou un couple avec de jeunes enfants. Le patio couvert est un endroit idéal pour regarder ou lire un bon livre. Louer en combinaison avec l'unité supérieure de cette propriété pour plus d'espace, contactez-nous directement pour plus d'informations! 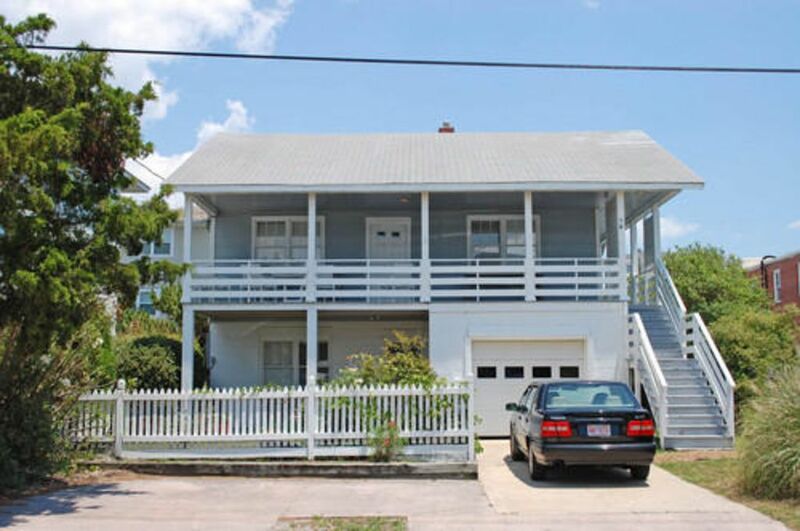 This is a lower unit that is reasonably priced for Wrightsville Beach rentals. Quite noisy given the lack of noise suppression between floors. Wall coverings are deteriorated, peeling and torn. Beds are VERY uncomfortable. We had to remove beds from frames and support under mattresses with wood from closets to sleep. It is dog friendly so if you are allergic to dogs RUN! Dog hair under cushions and under tables in living room. We needed to call for a complete set of towels we ordered. Smelled like Lysol when we walked in so we wondered if it was a masking agent. In summary, not the best. Mr. Hendrickson, I apologize that you were unhappy with your rental unit. I understand there may be issues with noise suppression between the upper and lower unit. However, most homes of older construction were not built to prevent the transfer of noise and there is little that can be done to remedy this due to the age of the home. We are currently working with the owner to take steps that will address the wall defects in the wall coverings as well as improve the preservation of this charming beach cottage. While this is a pet-friendly property we never want that to be obvious upon entering a property. I wish that you would have made us aware of the hair in the furniture and given us the opportunity to address these issues and resolve them for you prior to your departure. We were unaware of the problems you encountered with the bed frames and will certainly look into having them repaired or replaced if necessary. It is unfortunate that your linen order was incorrect when you arrived, although I believe we were able to promptly rectify this situation and provide the items that had been ordered. We value your business and hope you will choose to vacation with Bryant Real Estate again in the future. Amazing location, perfect spot for walking to beach. House is very run down and not taken care of. If you only use it to sleep and shower, it's perfect for the low price. I had a great time at the Craft house. It was the perfect spot for surfing the south end every day. Fine accommodations for the $. Covered patio and fenced yard were bonus for us and dog. I thought the street would be noisy but it wasn't. Wrightsville always pleases. Les tarifs indiqués ci-dessus n'incluent pas les taxes et les frais.